Clients of white and raw sugar are the main industries in the food and beverages sector in the country – local and multinational companies. In the global market, clients for sugar are large refineries, mainly located in the Middle East, North Africa and Asia. Clients in the domestic market are major fuel distributors, which acquire both anhydrous ethanol – to be added to gasoline in ratios according to local legislation in force – and hydrous ethanol, intended for consumers in service stations. Worldwide, ethanol clients are mainly located in North America, especially in the United States, through the wholly-owned subsidiary Eco-Energy, which also has Japan as its final destination. Relying on a unique business model in the industry, Copersucar does not have production assets, but rather contracts to acquire sugar and ethanol, mainly supplied by its Partner Mills. Copersucar and its Partner Mills have achieved a level of maturity and readiness for the market that allows them to supply large global consumers. This is the case for ethanol exports to the United States, which must comply with federal regulation of the Environmental Protection Agency (EPA), and the California market, which must comply with regulations from the California Air Resources Board (CARB), the state’s environmental protection agency. The company also has two important certificates, Bonsucro™, which sets out sustainability standards for sugarcane production and is required by both domestic and international clients, and the International Sustainability and Carbon Certification (ISCC), which governs trading of ethanol to Europe. It is the product that will be submitted to refining. The crystals are covered by a fine layer of honey, containing other non-sucrose components, which gives its characteristic coloring. It is sold in large volumes, mainly in the foreign market, having large refineries as clients. The main types are VHP (Very High Polarization) and VVHP (Very Very High Polarization). This is the sugar with one more step in processing, complying with Best Practices in Production and Food Safety, defined by Brazilian Health Surveillance Agency (ANVISA), rendering the product suitable for consumption. It is marketed in 50-kg sacks (in Brazil and abroad) and mainly in 1200-kg big bags for industrial clients such as producers of food and beverages. It receives this name because it is comprised of 99.3% ethanol, practically void of water. It is marketed to fuel distributors to be added to gasoline, currently in a 27% ratio, as per agreement with the Brazilian government. As another example, in the USA, the average is 10%, depending on local regulations. Its use reduces pollution and contributes to the reduction of global warming. This ethanol contains up to 7.5% water in its composition and is sold to distributors that market it to end consumers, in service stations. It can be used pure, or mixed in any proportion to gasoline in flex fuel vehicles, very common in Brazil. As with anhydrous ethanol, it provides the same environmental benefits and improves engine performance. Copersucar constantly invests in improving quality control in all steps of the value chain. Technical specifications in quality and certifications, as well as compliance with quality assurance standards, are defined according to the needs and demands of each product and market. All terminals used by Copersucar are submitted to thorough hygiene and cleanliness inspections and to the implementation of systems, such as pest control, prior to being released to receive products. On its own Terminals, an independent inspection company is responsible for collecting samples, monitoring unloading, and analyzing the product to verify compliance with the specifications. For Copersucar, quality is an important differentiator, combined with the soundness and reliability obtained in the market. The company also adds value to services by customizing services to each client. For products to arrive at their clients in dozens of countries, a complex logistics infrastructure is required, integrated by own and third-party transshipment and storage terminals, in addition to a comprehensive network of contracted highway, railway, and maritime carriers. Port terminal dedicated to sugar exporting activities located in the Port of Santos. The largest storage capacity for sugar and ethanol in Brazil, allowing for the storage of 2.5 million tons of sugar and 3 billion liters of ethanol (equivalent to over 18 million barrels). 500 hopper railcars dedicated to the transport of sugar. Multimodal terminals for sugar and ethanol in strategic locations throughout the state of São Paulo. Investments in integrated ethanol storage and distribution systems through pipelines, in partnership with Logum Logística S.A. The Copersucar Sugar Terminal (TAC), located in the Port of Santos (SP), was inaugurated in 1998 and is a strategic point for the company’s export activities. In 2013, it was rebuilt and its capacity was expanded. With the creation of Alvean, there was an increase in handling given the export of sugar from non-partner mills. Cargo handling was also diversified, with soy and corn shipments, allowing for greater use of terminal capacity and the achievement of the operational goal. Static storage capacity: 300,000 tons of sugar in bulk. Nominal loading capacity: 10 million tons (5,400 tons/hour). Greater use of rail transport: Estimated elimination of 100,000 truck hauls per year. The Fuels Terminal started its operation in September 2014, in Paulínia (SP). In 2016, the operation was expanded with two pipelines, each 1.8 km long, which interconnect TCE to Replan – a Petrobras Refinery located in the city, which connect to the Logum ethanol pipeline. In 2018, Copersucar and BP Biofuels created a 50/50 joint venture to own and operate the Terminal. Storage capacity: 180 billion liters. 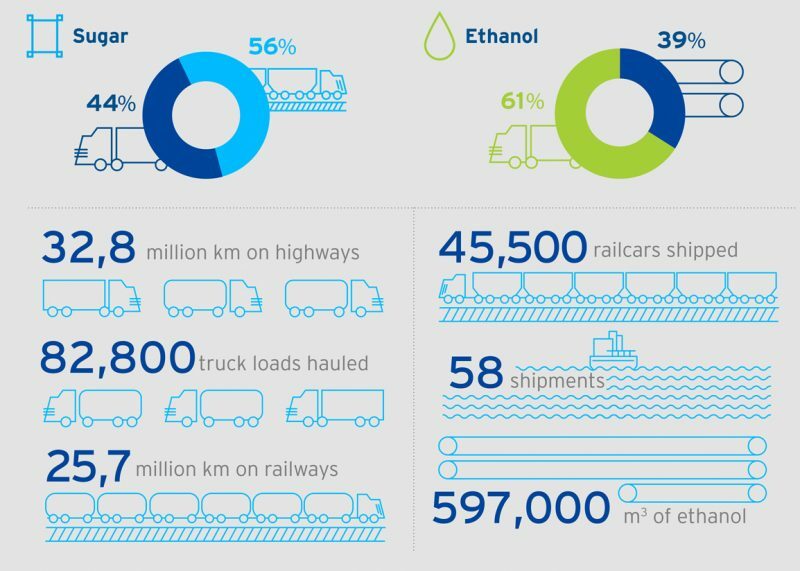 Operating capacity: 2.3 billion liters of ethanol per year. The multimodal terminal (road and rail) began operating in 2010 and focuses its activities on transshipment operations: sugar is transported by road to the terminal and is then loaded on trains to the Copersucar Sugar Terminal (TAC) in the Port of Santos (SP). Since its inauguration, the unit has received investments that have increased annual sugar handling capacity. Reverse loop: capacity for 89 railcars. Inaugurated in 2011, the multimodal terminal (road and rail) has the capacity to handle 700,000 tons of sugar per year. With transshipment operations, sugar is transported by road to the unit and is then loaded on trains to the Copersucar Sugar Terminal (TAC) in the Port of Santos (SP). All content of the website is offered to people aged 18 (eighteen) or older or to minors authorized by their parents or guardians. Copersucar reserves the right to assume that website Users meet the requirements above. Copersucar may change the format and contents of the entire website at any time, as well as discontinue its operation and restrict or terminate access to the website at any time, regardless of prior notice to Users. The content of the website, including text, images, sound, software, and codes that compose and operate this website, is protected by copyright and/or other intellectual property rights of Copersucar or licensed to Copersucar by their rightful owners. Likewise, all trademarks or service trademarks included on the site are property of Copersucar or have been licensed to Copersucar by their rightful owners for use on this website. Copy, distribution, or change, in any form, of the contents of this website or the use of the material contained on the website in any way other than presented therein is strictly forbidden. Moreover, the removal of any identification pertaining to copyright, trademarks, or intellectual property contained on the website is strictly forbidden. The use of any of the brands displayed on the website must have express prior written consent of Copersucar or of the owner of such trademark. The website may contain links to third-party websites and Copersucar shall not be held liable for any analysis, assessment, or content of such third-party websites, and Users shall be responsible for evaluating browsing and content of each such websites exclusively. Users are solely liable for the use they make of all contents, products and services made available through the website. Copersucar hereby attests that the information on the website is generic in nature and should not be taken separately as basis of decision-making. Copersucar uses its best efforts so that the content of the information on the website is accurate and corresponds to reality at the moment it is published on the website; nevertheless, Copersucar makes no claims to Users concerning its accuracy. Under no circumstances shall Copersucar, its affiliates, directors, or services providers be held liable for indirect, incidental or consequential damages or loss of revenue arising out of the use of the website, of information published on the website, or of the impossibility of access to the website. Considering that our website is freely accessible, except for areas requiring User registration, information like names or emails of Users are not collected, however, information regarding IP of the computer, location, time, time spent on the website, and device or browser used are collected. Although the website does not collect personally identifiable information, whenever Users access the website via search engines or third-party websites, it is possible that information such as name, gender, age group, and other personal information are received by the website. The website only collects the personal information that you willingly provide (using the mouse and the keyboard) when using our website. The information collected depends on how you use our website. Personal information shall only be used (i) in the delivery of products, services, or information requested from Copersucar, (ii) for security, credit check, or fraud prevention purposes, (iii) for a better understanding of Users’ needs and interests, and (iv) to improve website content, functionalities, and usability. To whom will we disclose private information? We may share the personal information collected on our website (i) with services providers rendering support services to the Copersucar website; (ii) within Copersucar and other companies of the Group; (iii) whenever, in good faith, Copersucar deems the disclosure appropriate in order to comply with laws, court orders, or summons; (iv) so as to prevent or investigate potential crimes, such as fraud or identity theft; or (v) in order to protect Copersucar’s right and security of other Users. Although all reasonable and commercially accepted security measures are in place to protect the confidentiality, integrity, and security of Users’ personal information, Copersucar does not guarantee the security of such information. Hence, we urge Users to adopt the precautionary measures required to ensure the confidentiality of their personal information when using the website and the Internet as a whole. Users are responsible for maintaining the confidentiality of their passwords and logins. We have the right to assume that anyone accessing our website with the login and password assigned to a given User has the right to do so. Users are fully responsible for the activities of anyone accessing the website using the password assigned to the Users, even when such person was not actually authorized by the Users. Whenever Users believe their passwords are being used without their authorization, they should change it promptly.